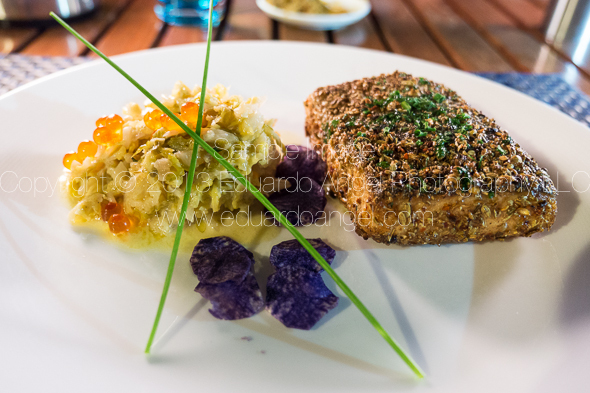 Shooting with the Panasonic Lumix DMC-GH3. Field report and impressions. That was pretty much my reaction when, a few weeks ago, just two days before I started teaching a “Digital Cinema for Photographers” event in Dubai, I found out that Panasonic, a major sponsor of the event, REALLY wanted me and my students to use a couple of GH3s and several lenses in my hands-on workshop. 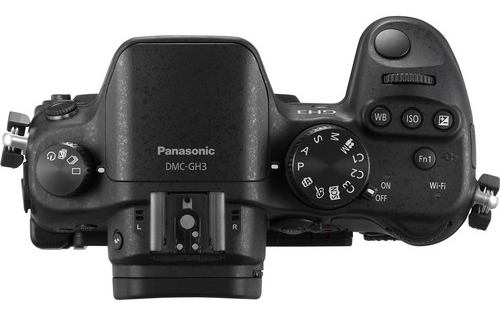 Panasonic is one of the largest consumer electronics companies, and the GH3 is the third generation of their very successful Micro Fourth Thirds DSLM (Digital Single Lens Mirrorless) system. For a while I have been aware of the low-budget-filmmaking community’s devotion to the hacked DMC-GH2 and its ALL-I codec. I saw the DMC-GH3 at Photokina last year, but I had never before shot a single frame with a Panasonic camera. The bodies that I was given were running Firmware v0.5. Add to this a nine-hour time zone difference and jet lag, and you can begin to imagine my pain. While I’ll be using some geeky terms, this is not an in-depth technical review, nor a scientific analysis of the GH3. You can dig into tech specs and MTF charts somewhere else. My goal is simply to share my honest and independent impressions, go over the things I liked and didn’t like, and communicate my wish list for future features. I want to emphasize that all the conclusions in this article are subjective and strictly based on my own personal experience. I have to respectfully disagree with Keanu on this one. Much to my surprise, the camera was much more intuitive than Sony’s NEX system, and several video features got my full attention right away. • Full HD 1920×1080 60p/50p (NTSC/PAL) with 30p/25p/24p options. • Ultra-high bit rate video recorded at 72 Mbps (ALL-I) or 50 Mbps (IPB). • Capable of recording continuously for an unlimited time for NTSC and 29 min 59 sec for PAL. • Native support for MOV (h.264), MP4, and AVCHD formats. • Time Code support in the MOV and AVCHD formats. • Extremely fast and accurate contrast-detection Autofocus. • A 3.5mm mic input AND a headphone jack AND the option to manually adjust the sound recording levels via touchscreen controls. • Full-time AF, AF Tracking, and Face Recognition AF are available for VIDEO. The Touch AF mimics rack focusing. Not having enough time to field test the Panasonic systems before the Workshop, I shot dummy clips in my hotel room and made sure that the footage would work in Adobe Premiere Pro CS6. The test went surprisingly smoothly. I then set both GH3 cameras to the same video settings: MOV at 1920×1080, 24p, 72 Mbps ALL-I, Standard Photo Style, White Balance at 5500K, got ND filters for all the lenses, extra batteries, and a few Class 10 SD cards. And then I prayed. 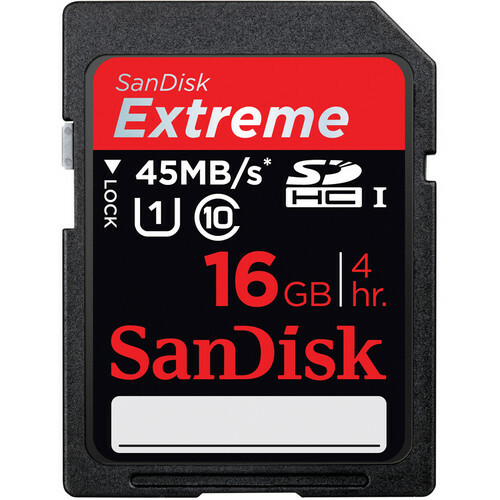 You must use a Class 10 SDHC card when recording Ultra-high bit rate video at 72 Mbps (ALL-I). Note: It’s extremely important to point out that full HD on this camera requires memory cards with the fastest speed available. My “older” memory cards didn’t work, giving me only four seconds of recording time. We spent the first day of my three-day Digital Cinema Workshop covering all the technical similarities and differences between stills and video. On the second day, we planned a location shoot with a Capoeira team and spent a couple hours shooting in the afternoon. On the third and last day we covered the different hardware and software requirements for post production and spent three hours editing the footage. I am especially proud of the short clip my students put together in such a limited amount of time and with newly acquired knowledge (and using brand new gear!). Capoeira in Dubai. Student Project. from Eduardo Angel on Vimeo. We could obviously use a few more days sweetening the audio, fine tuning transitions, and grading, but for a two-hour shoot and a three-hour edit, I believe this is a good example of what can be accomplished with great teamwork, interesting subjects, and the GH3’s many customizable options. Below you will see a few additional sample clips, all shot as H.264, 1920 x 1080, 23.976 72Mbps ALL-I, using the GH3’s “Standard” profile (Contrats = 0, Sharpness = 0, Saturation = 0, Noise Reduction = 0). The Exposure and White Balance were set manually. The lens was the Lumix GX Vario 12-35mm F2.8 set on AF Tracking mode, which worked very well most of the time. Despite the lens having “environmental sealing,” as you can see the fine desert’s sand inevitably found its way to the sensor. I put the clips together on Adobe Premiere Pro CS6, and have NOT done any grading nor sharpening. These short clips are intended to show you what the GH3 is capable of, not to tell a specific story. So, mission accomplished, right? Not so fast. A couple of days later, as I was wrapping up my day, a friend asked “Are you busy? I wanna show you something interesting.” With only the GH3, the 12-35mm 2.8 lens, a 4GB card and a low battery I jumped into his car. 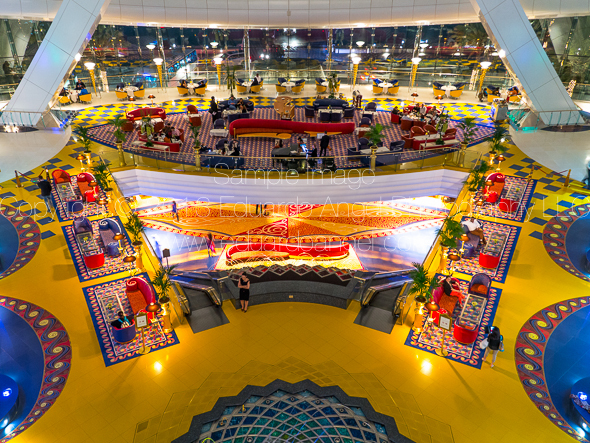 The “something interesting” happened to be access to the Royal Suite at the 7-star Hotel Burj Al Arab—a notoriously difficult area to access. With limited amount of storage space and battery life I managed to capture a few keepers. The 7-star Burj Al Arab hotel resembles a giant sail rising over the Gulf, with changing colors visible for miles at night. The very next morning (on my “day off”), I headed out to meet an old friend for brunch at the Atlantis. Should you ever find yourself in this neck of the woods, I strongly recommend that you pay the Atlantis a visit. As we enjoyed the seemingly endless food, my friend received a call to drive to Abu Dhabi right away to pick someone up and then drive back to Dubai. Would I like to come? Guess what I had hanging on my shoulder? This time I had a full battery and a 16GB card, but nothing else to shoot the magnificent mosque and the impossibly opulent Emirates Palace. Once again, the GH3 did a fantastic job. 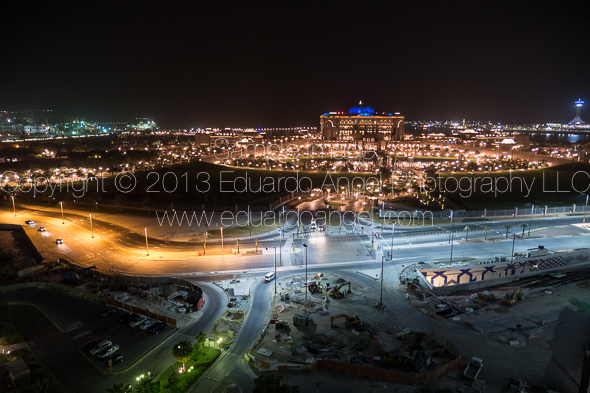 A nice view from a 25th floor overlooking the magnificent Emirates Palace in Abu Dhabi. 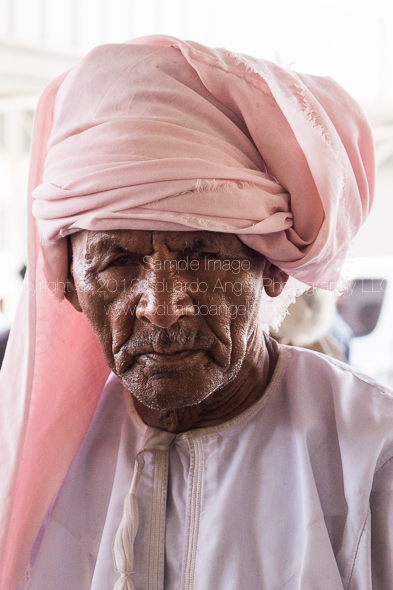 • The Panasonic RAW files (RW2) work fine in Adobe Lightroom [add link to LR workshop] but the most current version (4.3 as of this writing) is needed. Unfortunately there are no Panasonic lens profiles available as of this writing. • All the video formats worked seamlessly on Adobe Premiere Pro CS6. Even the video recorded at 72 Mbps was easy to preview and edit on a two-year old MacBook Pro (with 8GB of RAM and an external 7200 RPM Hard Drive as a Scratch Disk). • HDMI monitor output can be sent with or without information overlays. • I had a DMW-MS2 Stereo Shotgun Mic with me, but was happy to learn that the camera’s built-in internal microphones provide stereo audio. • The GH3’s sensor has a 4:3 aspect ratio. • Built-in Time Lapse, and HDR but unfortunately it works only for JPGs not RAW. • Five physical function buttons, and two touch-screen function buttons, all customizable with close to 40 options to choose from. • Virtually all the key shooting controls are within the right hand’s reach. This frees up the left hand to hold the camera or focus manually. • Excellent battery life, lasting a full day under normal operation. 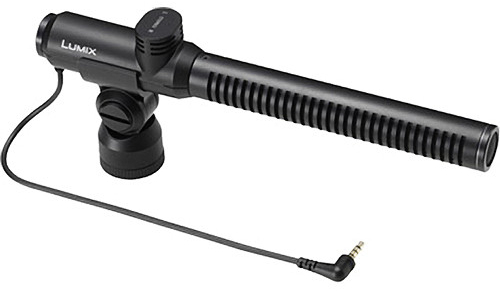 For extended video sessions I’d consider getting the DMW-BGGH3 Battery Grip. • Apparently (I have not tested this) the GH3 is also capable of real-time image output to the LVF or the rear monitor AND to an external monitor via HDMI. 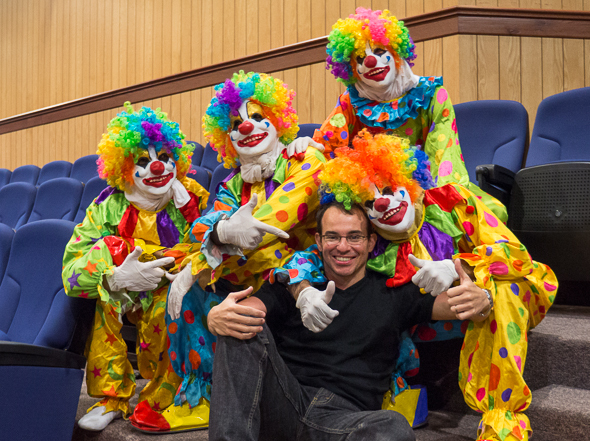 I shot extensively (more than 2,000 images in 18 days) with the Lumix GX Vario 12-35mm F2.8. The lens is tiny. And fast. And awesome. 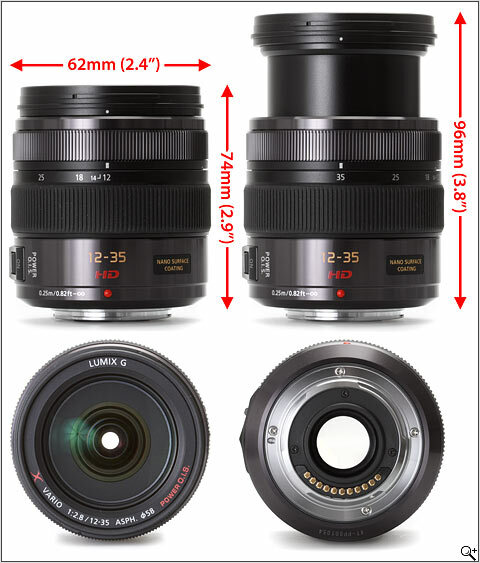 It has the equivalent focal length to a 24-70mm F2.8 on a 35mm system but it is a fraction of the size and weight. As you already know, this is a very good start when dealing with packing issues. In terms of depth of field, the lens behaves like a 16-45mm F3.5 lens on an APS-C sensor, or a 24-70mm F5.6 lens on a Full Frame sensor. It is hard to get used to this, especially when shooting another system simultaneously, but it is not a disadvantage per se. In terms of construction, the lens looks and feels good. According to Panasonic, this is first lens with any kind of environmental sealing, even though it is not exactly clear what that means. I found the lens a bit too distorted at 12mm but extremely fast and sharp. 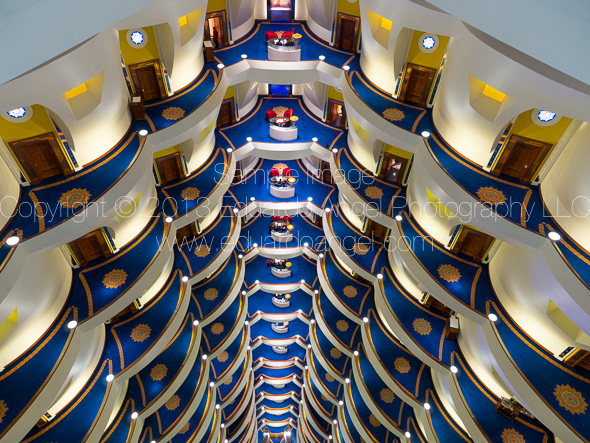 I would not recommend it for architectural photography, but it is a great choice for travel and portrait photography, as well as tight spaces like Dubai’s Fish Market, the desert from a moving car, or a $30,000-a-night Royal Suite at the Burj AlArab. 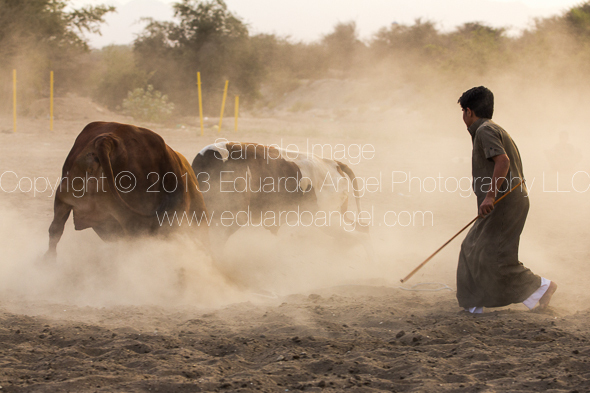 In many situations I also shot with my Canon EOS 7D and the exquisite (but super heavy) 70-200mm F2.8 LUSM lens. Combining the two systems to either play with the complementary focal lengths or dedicating one system to video (GH3) and another to stills (7D) proved to be extremely useful. The GH3 offers an articulating, high-precision, touch-sensitive, rear 3-inch OLED (Organic Light-Emitting Diode) display. This is especially useful for video because it allows for quick adjustments, including focus without making any noise. You can release the shutter, or set a focus area by simply touching it on the screen. It works in a similar way to Canon’s EOS M but the GH3 is much faster and reliable. The rear display is also ideal for low- or high-angle shots, and easier framing while using a handheld rig or steadycam. The viewfinder is a new OLED unit with 1.7 million dots, an aspect ratio of 16:9, and 100% coverage. I like it. It is large, detailed, bright, and comfortable even when wearing glasses. I found it extremely useful when shooting under low-light situations. Very annoying at the beginning, but super cool when you know how to use it, is the “Eye Sensor.” I set the camera to automatically switch between the EVF and rear display. In other words, it turned the viewfinder on when it felt the proximity of my eye/face and turned the rear display on when the eye/face moved away. The GH3 has a built-in electronic shutter that proved critical when shooting “incognito,” as it allows for noiseless operation. This and the free-angle rear display could be huge features for documentary photographers. Buried within the endless Camera Menus (and for some reason disabled on my camera), this function looks very interesting (if it works). When Silent Operation mode is enabled, the zoom, aperture, shutter speed, exposure compensation, ISO sensitivity, and mic level adjustments are all touch-controlled. Like many other competing cameras, the GH3 comes with integrated wireless connectivity (IEEE 802.11 b/g/n). What is interesting about this system is that besides a one-time app download, none of the features that connect to your tablet or smartphone require you to have a Wi-Fi network in range. The GH3 creates its own Wi-Fi network so that you can use these features in the middle of nowhere—like in the Arabian Desert, for example. 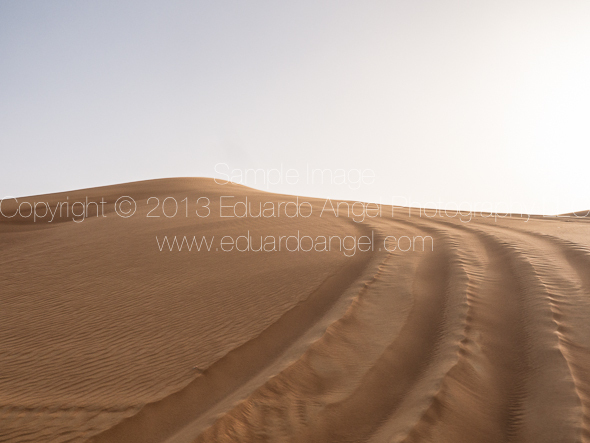 Arabian Desert, near the border between UAE and Oman. You simply need to have the Lumix applications on your computer or mobile device. Both Android OS and iOS are supported. Smart move. I tested the workflow on my ancient and unreliable Lenovo Tablet and my excellent Nexus 4 Phone, and both worked amazingly well. The total set up time took less than five minutes, including the app download and installation. Apparently it is possible to set various controls including focus setting, exposure compensation, ISO, WB, and Photo Style in addition to shutter release via live view using Wi-Fi. Even an “Auto Backup” function and Wireless TV Playback are possible, but I didn’t test these features. • The GH3 is apparently sold in two “flavors” PAL or NTSC. This is not something you can change on camera, unlike most other systems I have used. In a nutshell: US- and Canada-imported cameras shoot 24P, 30P, and 60P, while European cameras shoot 24P, 25P, 30P, and 50P. • The cameras I was given were running Firmware 0.5. The firmware update 1.00 has been announced but I have not been able to find it anywhere. The GH2 version 1.1, which contained some useful new features, wasn’t released until 18 months or so after the initial launch. I really hope Panasonic will react much faster this time. • High ISO performance. It might be the early Firmware version (v0.5) but I didn’t feel comfortable pushing the camera over 800 ISO. This was frustrating and limiting, and I certainly hope this is resolved in the full production models running v1.0. • There are several bugs in my camera. For example, if I turn the main dial to the “scene mode” (SCN) the camera freezes and the only way to get it back is by removing the battery. I am giving the early firmware version the benefit of the doubt. • The histogram is tiny. Even though you can change its placement on the screen, which is nice, I wish I could increase the size. 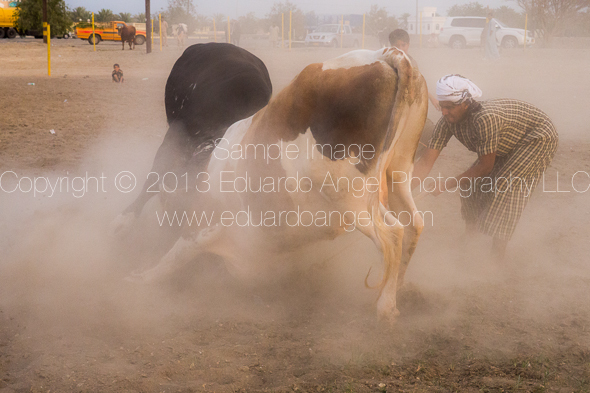 If you want to see more images, I posted a decent selec­tion on PhotoShelterhere. This article is copyrighted and may NOT be reproduced in part or whole in any electronic or printed medium without prior permission from the author. And don’t forget that personalized one-on-one consulting sessions are just a click away. UPDATE 20130328: The GH3 firmware update v.1.1 has been officially released. Download links available here. New Panasonic GH3 update brings Silent Mode. Same but different - Intro to Digital Cinema. Frame Rates and Shutter Speed. Quick tip. NAB 2013 is here. Ghost Town goes wild with DSLR Shooters. DSLR Video Shooter Interview; Panasonic GH3, Post NAB gadgets, backup solutions and more. What’s the big deal with ND filters? Traveling with photography and video equipment. Technical and Practical Tips. 7 reasons not to buy the Kindle Fire. I am a contrarian, or so it seems.